The Figure above is from paper/study #30. "The study has shown that suitable habitats of malaria vectors are generally found within a radius of 10 km in semi-arid environments, and this insight can be useful to aid efforts aimed at putting in place evidence-based preventative measures against malaria infections. Furthermore, this result is important in understanding malaria dynamics under the current climate and environmental changes. The study has also demonstrated the use of Landsat data and the ability to extract environmental conditions which favour the distribution of malaria vector (An. arabiensis) such as the canopy moisture content in vegetation, which serves as a surrogate for rainfall." "We find that CC may cause major impacts in landscapes covering between 16% and 65% of the global ice-free land surface by the end of the century, depending on the success or failure of achieving the Paris goal. Accounting for LUC impacts in addition, this number increases to 38%–80%. Thus, CC will likely replace LUC as the major driver of ecosystem change unless global warming can be limited to well below 2°C. We also find a substantial risk that impacts of agricultural expansion may offset some of the benefits of ambitious climate protection for ecosystems." "Our study identifies a threshold for CO2 tolerance in the phytoplankton community between 953 and 1140 μatm of CO2, above which productivity declines." 11. Are North American bird species' geographic ranges mainly determined by climate? "Using constructed water-air temperature relationships and historical air temperature records, we found that the reproductive phenology of G. selincuoensis was strongly advanced in the spring during the 1970s and 1990s, while the increased growing season length in the 2000s was mainly due to a delayed onset of winter. The reproductive phenology of G. selincuoensis advanced 2.9 days per decade on average from the 1970s to 2000s, and may have effects on recruitment success and population dynamics of this species and other biota in the ecosystem via the food web." "Climate science denialism is a form of pseudoscience. This contribution provides proposals for how to counter it, based on previous research on the demarcation between science and pseudoscience and on the author’s experience of tackling other forms of pseudoscience. Science denialism has much in common with other variants of pseudoscience, but it also has characteristics of its own. In particular, it is much more prone than other forms of pseudoscience to seek conflicts with genuine science. Like other science denialists, those attacking climate science have fabricated a large number of fake controversies in issues where there is no authentic scientific controversy. The defence of climate science against science denial has to take this into account. There is no reason to accept the denialists’ agenda or to treat their claims as legitimate alternatives to science. Climate science should primarily be presented to the public in ways that are independent of denialist activities, rather than reactively in response to those activities. Disclosures of the strategies, motives and funding of denialism are important contributions to the public understanding of the fake controversies. It is also important to document the scientific consensus and make it known. The public defence of climate science is an important and urgent undertaking, and active contributions by as many scientists as possible are needed." "Taste and quality were the most important motivators for eating meat, while moral/ethical factors were the least. Forty-nine percent of respondents indicated they would reduce red meat intake after exposure to an information only message, while the social norms frame was more effective than others (χ2). Awareness of the environmental effects increased significantly after messaging for all 13 impacts." 19. How do climate-related uncertainties influence 2 and 1.5 °C pathways? 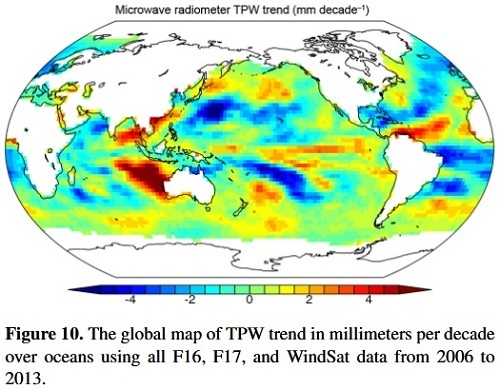 "Results show that these two TPW trends from independent observations are larger than previous estimates and are a strong indication of the positive water vapor–temperature feedback on a warming planet." "The surface mass balance (SMB) of the Greenland Ice Sheet (GrIS) has a nonlinear response to warming. Cold and warm anomalies of equal size do not cancel out and it is therefore important to consider the effect of interannual fluctuations in temperature." ... "For recent simulations of the Greenland Ice Sheet, we estimate the bias to be 30 Gt yr−1 (24–59 Gt yr−1, 95 % credibility) for a warming of 3 °C above preindustrial values, or 13 % (10–25, 95 % credibility) of the present-day rate of ice loss. Models of the Greenland Ice Sheet show a collapse threshold beyond which the ice sheet becomes unsustainable. The proximity of the threshold will be underestimated if temperature fluctuations are not taken into account. We estimate the bias to be 0.12 °C (0.10–0.18 °C, 95 % credibility) for a recent estimate of the threshold." "Glacier margins were mapped manually and reveal that in 1960 the mountains contained 2349 glaciers with a total glacier surface area of 1674.9 ± 70.4 km2. By 1986, glacier surface area had decreased to 1482.1 ± 64.4 km2 (2209 glaciers), and by 2014 to 1193.2 ± 54.0 km2 (2020 glaciers). This represents a 28.8 ± 4.4 % (481 ± 21.2 km2) or 0.53 % yr−1 reduction in total glacier surface area between 1960 and 2014 and an increase in the rate of area loss since 1986 (0.69 % yr−1) compared to 1960–1986 (0.44 % yr−1). Glacier mean size decreased from 0.70 km2 in 1960 to 0.66 km2 in 1986 and to 0.57 km2 in 2014." "This study presents diminishing ice cover in the Kangri Karpo Mountains by 24.9 % ± 2.2 % or 0.71 % ± 0.06 % a−1 from 1980 to 2015 but with nine glaciers advancing. By utilizing geodetic methods, glaciers have experienced a mean mass deficit of 0.46 ± 0.08 m w.e. a−1 from 1980 to 2014. These glaciers showed slight accelerated shrinkage and significant accelerated mass loss during 2000–2015 compared to that during 1980–2000, which is consistent with the tendency of climate warming." 48. Have human activities changed the frequencies of absolute extreme temperatures in eastern China? 57. What has controlled the poleward migration of annual averaged location of tropical cyclone lifetime maximum intensity over the western North Pacific since 1961? "Carbon models suggest the permafrost carbon feedback (soil carbon emissions from permafrost thaw) acts as a slow, unobservable leak. We investigate if permafrost temperature provides an observable signal to detect feedbacks. We find a slow carbon feedback in warm sub-Arctic permafrost soils, but potentially rapid feedback in cold Arctic permafrost. This is surprising since the cold permafrost region is dominated by tundra and underlain by deep, cold permafrost thought impervious to such changes."